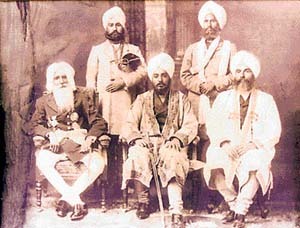 Sikh luminaries of Nabha come together: Sitting from left, Maharaja Hira Singh of Nabha, Tikka Ripudaman Singh and Bhai Kahn Singh A turban, three swords, a cloak, a comb with hair of Guru Gobind Singh and a hand-written piece of paper (manuscript) of the10 th Sikh Master are the relics erstwhile princely family of Nabha state has agreed to hand over to the Punjab government. These relics at present in the union capital earlier were on display display in the Palace of Nabha before these were moved to Delhi. Tarlochan Singh, MP, who belongs to Patiala, reportedly persuaded Raja Hanuwant Singh, son of last Maharaja of Nabha state Pratap Singh, to hand over the relics to the Punjab government. Raja Hanuwant Singh filed an affidavit in the Punjab and Haryana High Court conveying the decision of the princely family to hand over the sacred relics to the Punjab government. The court has directed the Punjab government to constitute a four-member committee to receive the relics from the Nabha family in two months and decide a place to display these relics. Residents of Nabha had moved the Punjab and Haryana High Court seeking directions to the Nabha family to hand over the relics back to people of Nabha for displaying. The petitioners even offered to meet bear maintenance and upkeep cost of the relics saying these had become part and parcel of their life for they had been having “darshan” of the relics as religious routine. Earlier, saysTarlochan Singh, “I had requested the Punjab chief secretary to persuade the Nabha family to hand over the relics to the state for proper upkeep, maintenance and display. Now as the Nabha family has conceded the request of residents of Nabha and Tarlochan Singh, he wants these be first taken to Nabha for “public darshan” before a decision is taken on permanent exhibition or display centre for the relics. Tarlochan Singh also wants the Punjab government to appeal to all families which may be in possession of some other relics of Sikh Gurus to hand over these to the state government by following the Nabha family. Its common that few people pretend to be royals but they are not. theres no royal family from name PARMAR from Nabha village nor even in INDIA. Whomsoever he/she might be is fake. There are a few people whose nick name is RAJA (means king) they prefix raja with their real name to pretend to be royals as theres a od politician from Nabha RAJA NARINDER SINGH who is not from a royal family. There is no one with PARNAME belongs to any ROYAL FAMILY IN INDIA. Though the four of the Punjab princely states BHADAUR,PATIALA, NABHA AND JIND ARE PHOOLKAS (SIDHU PHOOLKAS)…….. Maharaja of KAPURTHALA was AHLUWALIA, not a jat clan. Whomsover said u hes PARMAR and belongs to a royal family is 100% lie. Maharaja Nabha is from Phoolkian dynasty and related to me. Yes, I knew one Mr. Devinder Singh Parmar who was from Nabh Family. years ago due to heart attack, living behind 2 highly qualified daughters. You could find more information on Internet or you should try to contact and elderly Sikhs living in the UK. You are mistaken parmars do not need to become fake rajas because their history is far superior than phoolkas of phoolka estates . As this marriage alliance was done according to the wishes of maharaja ranjit Singh . Raja Arjun singh’s father sardar karam Singh was a great fighter and owner of 2/3 territory in central amritsar, Katra karam Singh and one of amritsars 12 gates are named after him , he strengthened the fort of ranghar nangal and was a very powerful majha chief and owner of territory worth lacs of rupees .the family had zaildari rights over 1500 acres of land in Nabha area . The family fought with the Britishers in Anglo sikh wars were heavily penalized by Britishers and the fort of ranghar nangal which offered continuance resistance to Britishers was destroyed by gen wheeler (written in general wheelers diary ) the widows of ranghar nangal felt safer in Nabha because their own grandson was the maharaja of Nabha .and started living there. Each word I have said here is from different additions of chiefs and families of note in punjab and rajas of punjab by griffin lepel, and c.f.massey and is available on the Internet in chiefs of ranghar nangal additions . Raja narinder Singh of Nabha is direct decendant of raja Arjun Singh of ranghar nangal and very much a royal .but the people of Nabha do not only respect him because he belongs to any royal family that does not matter at all ,he is perhaps the most honest politician in the history of punjab ,he did not face any corruption charge in his entire political carrier spanning over six decades. I have done research on Nabha and ranghar nangal families ,kindly read all additions of chiefs and families and you will get all answers. Everything is available online. Thank you so much for your information Gurdeep Singh Kundan, Naresh singh Panwar and Gurrattan. Davinder Singh Parmar was as honest and loyal to his fellow Sikhs as his brother Raja Narinder Singh was. He was a very kind man to everyone that knew him and when he passed away in London, he was carried on a platform through the streets of London with hundreds of fellow Sikhs and english friends, in procession. Swords were drawn which I understand is not normally allowed in London but was allowed for him. He was given a funeral that has never been seen before in London and will never be seen again. Raja Narinder Singh’s last name was Parmar and he was from the royal family of Ranghar Nangal. Record for which can be found in the book ” chiefs and families of note of Punjab”. I have heard a lot about Sardar Davinder Singn G from my grandfather Raja Narinder Singh. If you are in any way related we should get in touch.